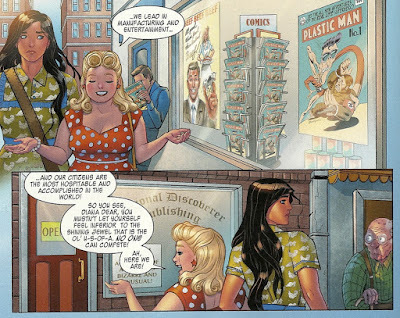 The Legend of Wonder Woman #5 (DC Comics) If you read this week's issue of Renae De Liz and Ray Dillon's Legend of Wonder Woman–and you should have–then you were probably thinking the same thing I was when I saw the above panels. First, you thought, "Oh cool, Plastic Man!" and then you thought, "Wait just a darn second! That's not what the cover of Plastic Man #1 looked like! And it debuted in 1943, not 1944! And whose art is that, anyway? It sure doesn't look like Jack Cole's!" (It actually made me think of Derf's art at first glance; I can't make out the signature). Well, on further reflection–and upon scanning and zooming in on it–I see the poster advertising the issue says "Get The All New Adventures of the Real Life Superhero," so, in this discrete "continuitiverse" Plastic Man is a real superhero and the star of his own, probably semi-biographical comic book (not unlike those published about the Fantastic Four and company in the Marvel Universe), and it naturally doesn't align perfectly with the Plastic Man comics of our own world. This is one of several little cameos from the wider DC Universe in this particular issue of De Liz's retelling of Wonder Woman's origin. She visits a young reporter named Perry White whose dream is to one day "start a respectable newspaper of my own!" to learn more about the mysterious Duke of Deception he wrote about, and, in another panel, there's a soldier named Kent writing a letter addressed "Dear Martha." In this issue, Etta takes her new friend Diana into the city of Boston, where Diana experiences her first car ride, sky scrapers, movie, popcorn and learns that women aren't allowed to fight in the war. The culture clash business is generally a good go-to gag for modern Wonder Woman stories, and while De Liz's isn't the best I've seen in recent years (it's hard to beat that Noelle Stevenson-drawn short story from Sensation Comics), it's not bad at all. I did find myself musing about the "best" setting for Wonder Woman's origin yet again, though. Unlike her contemporaries, Wonder Woman is rooted in World War II in a way that makes it a challenge to bring her into the modern world (a rich kids parents can get gunned down in an alley in any year and still produce a Batman, for example, and a rocket ship from a distant planet of super-people can crash-land in the heartland any time). De Liz's story is set in the 1940s, which has allowed her to use many of creators William Moulton Marston and H.G. Peter's original characters and concepts without too much in the way of reinvention (this issue, for example, prominently features barely-changed versions of both Etta Candy and Steve Trevor, for example, characters whose roles were diminished to unrecognizability when George Perez tried reinventing Wonder Woman post-Crisis). Here I noticed a potential downside to keeping her origin in the original setting, however. When Diana marches into the recruitment office and asks to be sent to France to fight in the war and is rebuffed, or when a newspaper man calls her and Etta "broads," it's easy for a modern reader to compartmentalize the sexism she faces as an old problem of our grandparents' age, something we've taken care of and thus no longer exists. And, since you are reading this on the Internet, then you know sexism, like racism, isn't exactly "over," it's just changed and moved, and is no longer as public as it once was. Today a Diana Prince might still not be able to serve in front line combat duty, or join particular factions of the U.S. military, but she wouldn't be turned away at the door and told she can serve by getting married, having kids and keeping house. I don't think De Liz was implying that sexism is over or anything, it's just something I noticed while reading this issue and seeing Diana encounter the sexism of 1944 America. She's a tough character to write, basically. In terms of essential plotting, keeping Wonder Woman in her original, essential World War II milieu seems to be the easiest and best way to go (although it does divorce her from participation in the DC Universe, which is why she keeps getting moved out of the 1940s), but, in terms of the character's conception as an advocacy character, then moving her into the modern era of the readers seems to be the best way to use her. I guess it's a good thing DC is currently publishing enough Wonder Woman comics that we can read about her adventures in both eras at the moment. Scooby-Doo Team-Up #16 (DC) When Billy, Mary and Freddy are all taken captive by The Monster Society of Evil, Uncle Marvel and Mr. Tawky Tawny call on Mystery Inc to help out, as they specialize in investigating monsters. Once they learn exactly what the Monster Society of Evil is and who its members are, it doesn't take the gang long to find out where their hide-out is, but they still have to battle them. 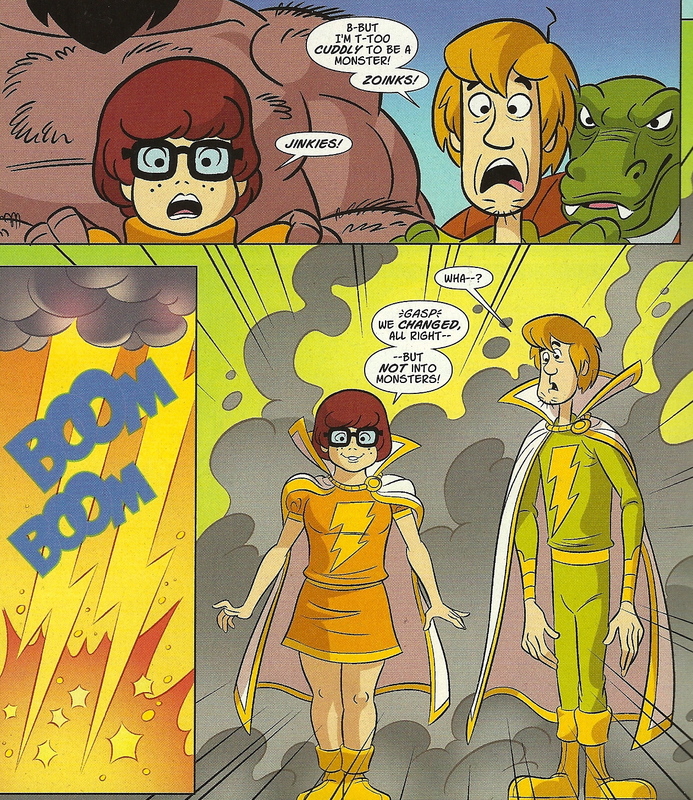 Luckily, the old wizard Shazam helps out by finding the right mythological figures to change Shaggy and Velma's catchphrases into magic words. Writer Sholly Fisch and artist Dario Brizuela pack in so many Marvel Family characters that it's easier to point out who's missing (The Lieutenant Marvels and Black Adam) then to name them all. 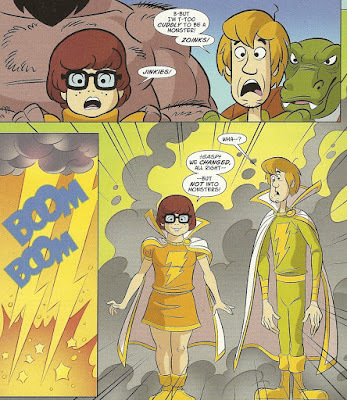 While the plotting is necessarily compact (the Society has captured the Marvels, the good guys need to save them), Fisch finds plenty of room for jokes, several made at the expense of the Marvel characters (Mister Banjo gets not respect), others by pairing Shaggy's cowardice with the fantastical elements of Captain Marvel comics ("Just a little worm?" he says upon meeting the leader of the Society, "Even I'm not afraid of that!" Whether you're a fan of Scooby-Doo, or the Marvel Family or both, this is a pretty good comic that should be quite relevant to your interests. Given the aversion of the editors and writers of the DC Universe side of the publisher, who have regularly been trying to reinvent Captain Marvel for well over a decade now (and seem to have settled on a dim-witted, juvenile Superman with a hood who leaks lightning bolts), I suppose it's well worth mentioning that these are the classic versions of the characters, complete with the real names: Captain Marvel, Mary Marvel and Captain Marvel Jr. This version of Etta Candy has simply been a delight.